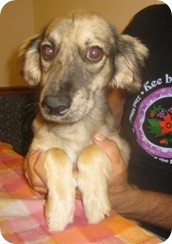 Jesse is new to our program and we think he is a sheltie mix – emphasis on the mix part. He has unusual markings and is actually a cool looking dog – one of a kind that is for sure. He does well with the other dogs and with the cats. Not sure about small children. Appears to be housetrained, at least he has not had an accident yet. He is still new so that is about all we know for now.